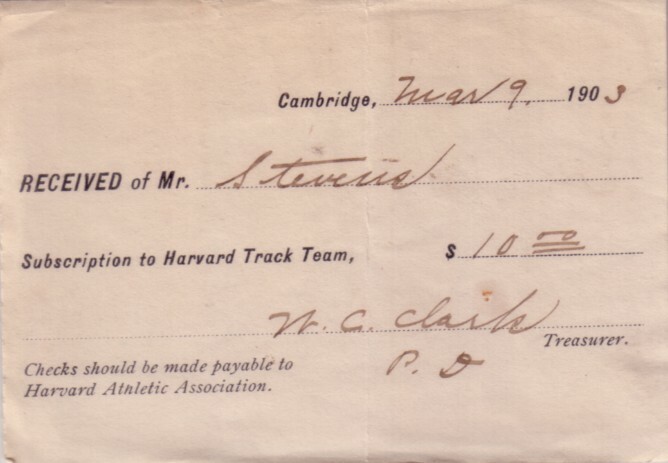 ORIGINAL, AUTHENTIC 1903 Harvard Athletic Association receipt for the track team that may have served as a season ticket. Measures about 3 by 5 inches and dated March 9, 1903. 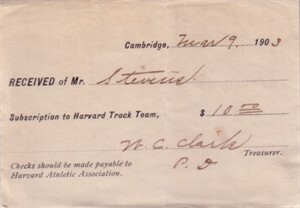 The back is blank; the name Mr. Stevens is written on the front with the signature of the team treasurer. Yellowed with one vertical crease down the center, overall in excellent condition. ONLY ONE AVAILABLE FOR SALE.